Chorao Island in the Mandovi River is a veritable nest for flora & fauna, which is why it is also home to the Salim Ali Bird Sanctuary. So if you are a nature lover, then next trip book yourself into the Viva Chorao property and you will thank us for sure. 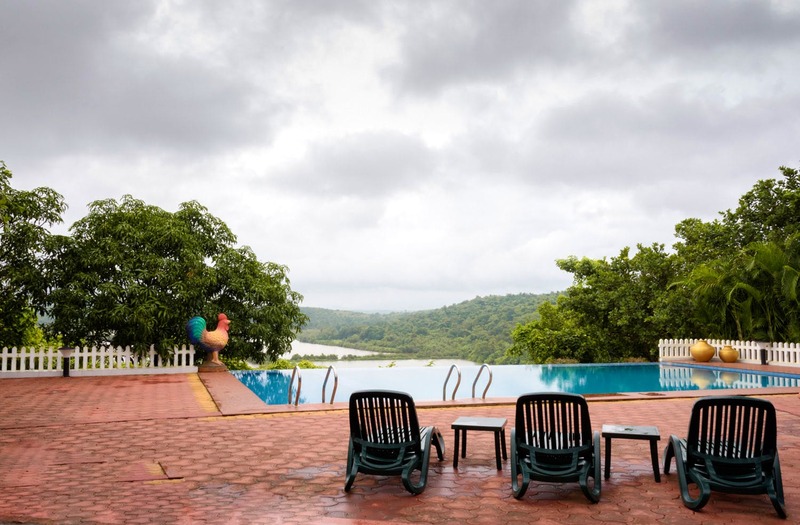 Perched on a hill with views of the Mandovi river flowing around you, thick vegetation all over, lush green fields surrounding the low areas of the island, an infinity pool overlooking these sights and cute cottages are what one can look forward to here. Be it cycling around the property or the island, (cycles are complimentary), or arranging for boat or walking tours to the Bird Sanctuary, crab catching trips, these guys can arrange it all. Not to forget, the plethora of fruit trees, a kids’ play area, a spice garden, vegetable garden, or even the Flaming Hut for those barbeque evenings, they have thought about everything. But what we loved was the watchtower made out of an old weighbridge, that one can climb and get an even more gorgeous view not just of the island, and the river, but even the steeples of the churches in Old Goa and the neighbouring Divar Island. With only 5 cottages, (all named after birds that are visitors to the property) and maybe a few tents coming up after the rains, they want to ensure that every guest has ample space and privacy. They have a large lawn, as well as a covered space to host events. So if you want to skip the beach and do a destination wedding amidst nature or even that 25thBirthday or an Anniversary celebration, then again this venue will definitely take everyone’s breath away. And lest we forget, if you are looking to just have a day out, and are a group of 15 or more, you can book this whole property for that company offsite or a picnic. You can take your own hard liquors or wine and can buy port wine, mixers & beers (priced very reasonably, beer pint only at INR 48) from them when you want to have a party, wedding, picnic or just a relaxed stay.